Graduation caps went flying as the Burlingame High School Class of 2011 was received and recessed Sunday. 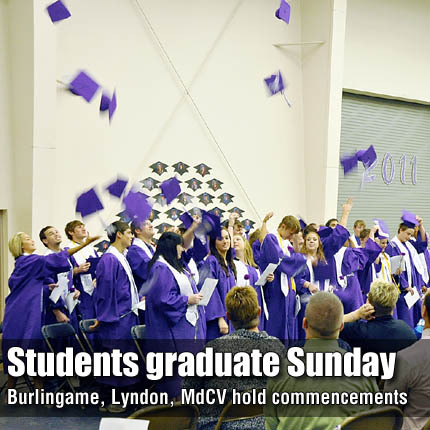 Burlingame, Lyndon and Marais des Cygnes Valley high schools sent off a combined 80 seniors at ceremonies held at each school last weekend. Members of Burlingame High School Class of 2011 entered the gymnasium Sunday to the familiar tune of “Pomp and Circumstance,” and walked out as graduates. Graduating seniors, Burlingame school board members, and a packed house of attendees were welcomed by superintendent, Allen Konicek. Tammy Baird, Burlingame High School Principal, then introduced Salutatorian Jodi Roberts. For the complete story, see Page 9A, or subscribe to the print or online edition of The Osage County Herald-Chronicle at www.och-c.com/subscribe.html. LYNDON—Years of elementary, middle school and high school education came to a close as 34 Lyndon students completed their public education Sunday in the Lyndon High School gymnasium. Led by junior escorts Emilee Burkett, Jordan McGonigle, Malori Gales and Nick Walsh, the graduating seniors entered the gymnasium to a processional from the LHS band. The crowd, which nearly filled the upper level of the room, rose as they entered. Senior Class President Heidi Schooler welcomed the class, and presented the class key to junior class president Joseph Langer. For the complete story, see Page 7A, or subscribe to the print or online edition of The Osage County Herald-Chronicle at www.och-c.com/subscribe.html. MELVERN—The graduating class of 2011 at Marais des Cygnes Valley High School met one last time as a whole when they received their diplomas Sunday afternoon in the high school gymnasium. The class was led into the packed gymnasium by Kylie Vanderpool and Matthew Boggs, with candles being lit by Natasha McCurdy and Cody Poeverlein. Following the processional, “Pomp and Circumstance,” played by George Alexander, MdCV High School Principal Steve Burkdoll welcomed students, parents, extended family members and friends of the class. For the complete story, see Page 8A, or subscribe to the print or online edition of The Osage County Herald-Chronicle at www.och-c.com/subscribe.html.